With a full checklist of features ranging from the light weight air blown design, to the powder coated tubular frame that resists rust, this durably constructed mobile table and seating option affords you and your guests with comfort as well as utility. Featuring no-marring foot caps that protect your precious floors, to the metal foot rails on the chairs that provide allow for a place to rest and relax your legs, this practical table and chair combo has all of the bases covered. Great as a hobby table, tailgating table or for outdoor food prep, this Lifetime Adjustable Height Commercial Folding Table is built to serve a variety of purposes. With lightweight portability and three adjustable height settings, it's handy to have around indoors or out - you can raise it for standing use or lower it for a children's activity, and you'll appreciate the low-maintenance plastic tabletop that's stain resistant and easy to clean. This table is constructed of high-density polyethylene plastic (HDPE) with a honeycombed tack-off design for extra rigidity and powder-coated steel to ensure durability, so its weather-resistant design can hold up to extreme wear and tear. No matter where work or play takes you, the Lifetime 4 ft. Adjustable Fold-in-Half Table is the perfect companion. From holding supplies at a job site to tailgating at your favourite sporting event, this portable table is ready to go where you go. The table offers three height settings to accommodate your various needs and projects, and a stain-resistant surface that's easy to clean. When the big game is over, simply fold it up and store it away. This design features a patented combination of high-density polyethylene (HDPE) plastic with a honeycombed tack-off design for extra rigidity and powder-coated steel to ensure durability. This results in a rugged, stain-resistant, scratch-resistant table that requires very little maintenance, sure to last for seasons to come. 5-Piece Resin Folding Table and Chairs Set With a full checklist of features ranging from the light weight air blown design, to the powder coated tubular frame that resists rust, this durably constructed mobile table and seating option affords you and your guests with comfort as well as utility. Featuring no-marring foot caps that protect your precious floors, to the metal foot rails on the chairs that provide allow for a place to rest and relax your legs, this practical table and chair combo has all of the bases covered. 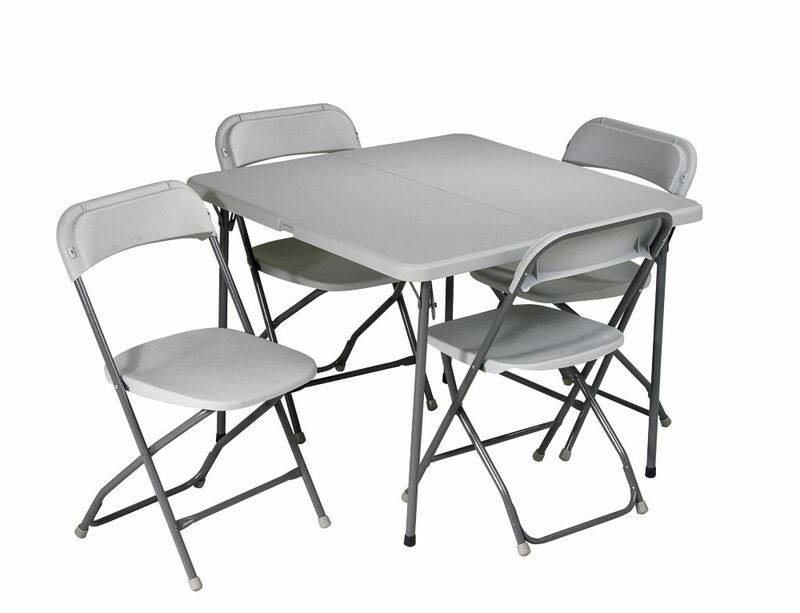 5-Piece Resin Folding Table and Chairs Set is rated 4.8 out of 5 by 5. Rated 5 out of 5 by mcelvahh from Yes, expectations were met. ... Yes, expectations were met. Rated 5 out of 5 by Eileen from The set was very nice looking. Also, I liked... The set was very nice looking. Also, I liked the idea tht the table folded. Great buy. Lastly, the price was excellent. Rated 5 out of 5 by Joyful from Great purchase Sturdy and very easy to set up and put away. Perfect table for working on the computer, writing or dinner. It is great!